Shake it Up Baby! 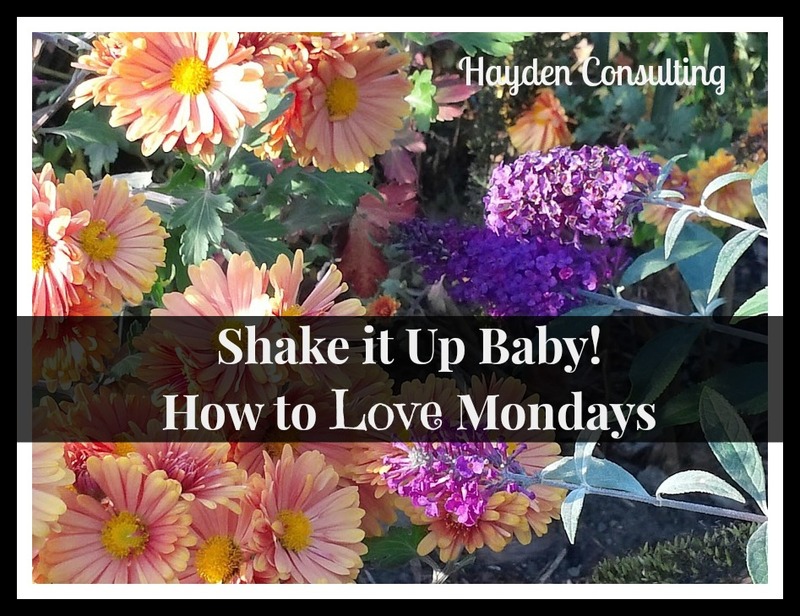 How to Love Mondays – Hayden Consulting – Where Your Success in Business and Life Matters! That’s how you can start loving Mondays. Yes, I said it – Love Monday and Tuesday, and Wednesday and Thursday! You already love Friday, right? Well, get ready to love the others by Shaking up Monday. What will you eat?- Prepare your lunch & healthy snacks. Where is it? – Put your keys, purse/wallet, coat/shoes, etc. near the door. Eat a healthy Breakfast! Do not skip this important meal. Leave early enough to allow yourself plenty of time to arrive at work without feeling rushed. Act like it’s the happiest day of your life. Learn something new – Look to learn better & fresh ways of doing things by reading books, magazines, listening to podcasts, watching a webinar, attending seminars and learning from those around you. Remember this, you can learn a lot by getting feed back from your customers/patients (good & bad). Get some fresh air – if possible, eat your lunch outside the office or take a short walk during your break. A breath of fresh air and change in scenery will help clear your mind and reinvigorate you. Drink plenty of water and eat foods that refresh, not ones that make you feel tired & sluggish. Work from a to-do-list. If there’s something that must be done, go ahead and get it finished. Get busy, get it done, and feel the freedom of no longer having it hanging over your head. This entry was posted in Customer Service Tips, Dental Success, Marketing Ideas, Practice Management, Work & Family and tagged bacon and kids, betty hayden, betty hayden dental consultant, business success, chiropractic marketing ideas, customer service, dental advertsing, dental coaching, dental consulting, dental marketing, dental marketing consultant, dental marketing goals, dental marketing ideas, dental office success, dental practice management, dental success, exceed expectations, exceeding patients expectations, grow your practice, happy employees, happy life, happy team, hayden consulting, how to bring in new patients, how to grow your dental practice, how to have a great day, how to have happy employees, how to keep patients, how to love monday, i hate monday, monday, morning huddle, morning meetings, practice management and marketing consultant, shake it up baby, successful people. Bookmark the permalink. Pingback: Dental Marketing and Practice Management Idea’s for January (2016) | Hayden Consulting – Where Your Success in Business and Life Matters! Pingback: Dental Marketing and Practice Management Ideas for June – Hayden Consulting – Where Your Success in Business and Life Matters! Pingback: Dental Practice Management Ideas and Reminders for the month of June – Hayden Consulting – Where Your Success in Business and Life Matters!